The Laserscope Aura StarPulse laser system is affordable, versatile and easy to use for a variety of cosmetic applications including vascular lesions, wrinkle reduction and acne treatment. It weighs less than 75 pounds so it can easily be transported. With Laserscope’s exclusive StarPulse technology, the Aura system can deliver variable bursts of energy at widths from 1 to 30 milliseconds or it can be set for continuous wave mode. This compact cosmetic laser system is fully portable, and because it can operate with a 110 V outlet that makes it even more portable than many other comparable models. This system is also extraordinarily easy to use and has been proven to be effective for many years. To get the lowest price on a Laserscope Aura StarPulse system or any other cosmetic laser equipment, just fill out the contact form below and we’ll get right back to you with a quote. The Laserscope Aura StarPulse is a very popular model because of its reputation for reliability and durability, but you still need to make sure you are buying from a reputable seller of refurbished cosmetic equipment, like UsedCosmetic.com. 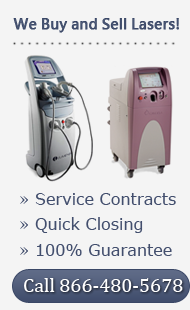 We offer a 100% satisfaction guarantee and the security in knowing that all of our cosmetic laser equipment has been reconditioned and inspected by a professional technician. We also offer fast and insured shipping. Our goal at UsedCosmetic.com is to offer the best prices on used cosmetic equipment along with exceptional customer service. Contact us today if you have any questions about this model or want the best deal on a Laserscope Aura StarPulse system.